A new generation 1m antenna from Korea with wireless antenna control. The antenna is accessable via Blue-tooth allowing the antenna to be controlled by a laptop, at the antenna during setup and troubleshooting, rather than from the below deck unit. The bluetooth connection allows up to 100 meters betrween the antenna and the controlling laptop or device. It also has a self diagnostic mode that checks all settings and movements of the antenna after the antenna has been serviced. The antenna weighs 114 kg and comes with several BUC options between 4 Watt and 40 Watt. At first glance, the Korean built KNS antenna appears and functions very much like one of the better known antenna brands, with a cross level beam and a belt driven level cage providing the stabilization. But that is where the similarity ends. 32bit 150MHz processor provides exceptional computing power. Bluetooth control of the antenna over the receive coax. 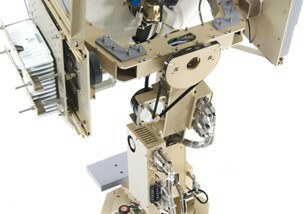 The tracking tuner is housed in the antenna, not in the below deck equipment. Built in pre- programmable menu of 80 satellites with different searching or tracking references..
Ability to search on AGC threshold, C/N, or modem lock. Ability to track on AGC or C/N. 24V or 48V BUC power supply built into antenna controller (up to 8W BUC). All tracking and stabilization functions are controlled by the antenna. The BDE is really just an interface. Most marine stabilized antennas search for the satellite on the signal strength or AGC from the DVB or narrow band tuner. After finding a signal that is stronger than the threshold, the antenna will start tracking and then look to see if the modem has carrier lock. 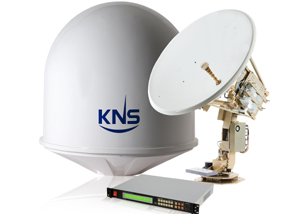 The KNS antenna has the capability to search first on modem lock, which is a very positive confirmation that you are on the correct satellite. Having spent many hours watching other antennas painfully search, in tiny circles, for satellites that seem to have disappeared from the sky, it is quite refreshing to see the KNS antenna making bold sweeps of the horizon and latch onto it's target in a matter of seconds. 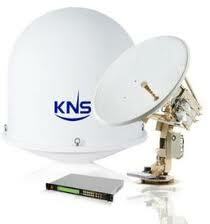 Of course this requires a stable and accurate LNB to allow the modem to lock quickly once it sees the satellite. This positive identification allows one the flexibility to use a magnetic compass, or even no compass at all, as there is little chance of ending up tracking the wrong satellite. A good gyro heading input is always preferable. Other inovative searching options, that work extremely well to determine that you are on the correct satellite, include the carrier lock of the internal DVB/DVB-S tuner, DVB C/N (carrier to noise ratio) threshold, powerful combinations of both DVB lock and C/N threshold or modem lock and C/N threshold. Of course there is also the conventional DVB AGC threshold and narrow band tuner(30KHz) threshold. Once the satellite has been positvely acquired, the signal is continuously peaked by tracking the DVB C/N ratio or the conventional DVB AGC or narrow band AGC. DVB C/N ratio is an extremely robust tracking reference, especially where adjacent satellites might cause the antenna to walking off onto a stronger AGC. 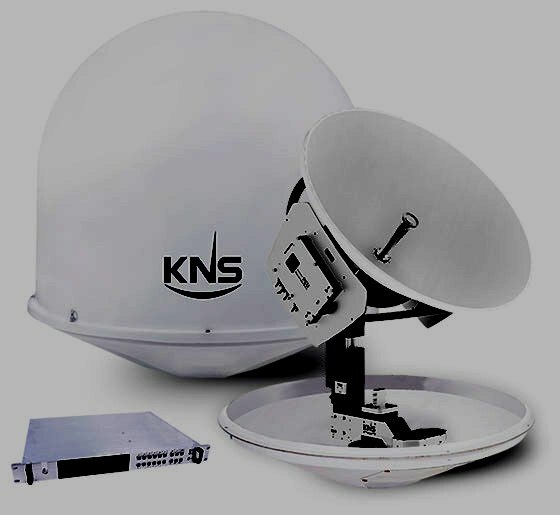 The following Norsat antennas are manufactured by KNS in Korea and marketed as KNS Z6 and Z12 and as Azimuth Unlimited AZU6 and AZU12 and Norsat COM6 and COM12. Well proven antennas with some great features like searching on modem lock and tracking on C/N rather than just signal level. Not to be ignored! 30657 visits to this page since 28 Nov 2012.